As the nation waits eagerly for the first of the televised debates between party leaders in the run up to this year’s general election it has been revealed that the shows may actually be cancelled due to the demands being placed upon organisers by the three main political parties. 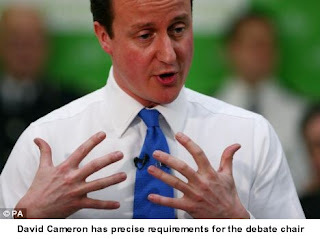 Other demands that have been revealed are that David Cameron wants a bowl containing only blue M&Ms to be within arm’s reach throughout the debate and that Gordon Brown has insisted that he has a swivel chair and a pure white kitten to stroke throughout each televised debate. None of the parties will agree on letting Alex Salmond of the Scottish Nationalist’s watch through a window during a mass debating session. Despite all the back-stage wrangling, the broadcasters and political parties are united in their understanding that what the British people want to see is an engaging and exciting spectacle that will enthral people the length and breadth of the nation. They know that the public wants to be glued to their seats for the full 90 minutes and cheering their side on as they push for the final stage of their quest for the ultimate prize. I heard that Brown only wanted to discuss questions of Keynsian versus moneterist economic policy, whereas Cameron wanted a round on sport and a round on the movie Avatar. Cameron loves Avatar 'cos it's only in a fantasy world that the blue guys can win. I think it would be interesting debate. who knows maybe candidates also use paperwriting-services.com for making their speech more argumantative. Wow get 500$ amazon gift codes for your online shopping and real time discounts only at amazon gifts centre.